Stefan Szymutko, as can be judged from declarative statements found in some of his writings, never wanted to be a “literary theoretician,” understood (very selectively and unfairly) as someone who in Heideggerian terms “talks away” the work of literature, keeping its truth from being voiced. Readers should not be swept away by the rhetorical force of such declarations, however. The distaste he expresses for theoretician-interpreters, who “would find it more convenient if the work did not exist,” has served the Silesian literary scholar in defending his own theory of the literary work, which is bound to a certain philosophy of literature and philology. This theory at first related exclusively to the historical novels of Parnickim, but was then was expanded to encompass an ontology of literature and the world and a concept of subjectivity. Still, why would anyone take on the concept of the “source” which Szymutko only presented in one article, never reprinted in any of his books, instead of simply describing this Silesian scholar’s entire polyphonic project, which combines literary scholarship, philosophy, and autobiography? The article “Źródło, czyli tekstu historii ciąg dalszy…” (The Source, or the Text of History Continued…) functions at the absolute margin of Szymutko’s work, reception of which has already been sufficiently dominated by the themes of Silesia and autobiography. As I will attempt to show, reconstructing the concept of the source is a task worth undertaking for at least three reasons. Firstly, that concept is developed on the basis of a meticulous reading of a particularly literary work, which describes or creates a certain phenomenon situated on the border between Genettean paratexts and “hipotext-hypertext” relations, and as a result, problematizes a series of poetological concepts. Secondly, it represents a revealing example of the interaction mentioned above of the various sources of inspiration that determine the idiomatic and polyphonic character of Szymutko’s work. Thirdly, the Silesian scholar’s concept enables us to understand the writing and methodology problems he encountered in his work putting together editions of Parnicki’s novels (Koniec “Zgody Narodów” and Słowo i ciało) with exhaustive commentaries intended to elucidate all the intricacies of those texts and allow other readers the “pure pleasure of studying decipherment.” Like the philosophers read by Jacques Derrida, who misguidedly introduced into their own texts concepts that dismantled the systems they had created, Szymutko created something that at a certain moment made his work practically impossible, while simultaneously impelling it forward. Before we can approach the problems mentioned above, however, we must first briefly describe the theory of the novel that extrapolated from the novel Końca “Zgody Narodów”, the subject of his doctoral thesis. Only a comprehensible work can be the foundation for a profound reading experience, and fully exhibit the value of writing. (…) The conventions for reading which I have proposed constitute an attempt to adapt the language of the receiver to the language of the sender and are based primarily on the view that Parnicki created his own novelistic language. [t]he text of history (…) does not permit one (…) to penetrate from name to object. In combination with the text of the work, it merely indicates the tension between language and reality; authentic events are only the horizon of the utterance. Let us here note the methodological undecidable that Szymutko hits upon. The text of history is simultaneously a hypotext preceding the text of the work, determining its shape, and something presented as the product of a certain transformational practice, closest to one of Genette’s types of serious transposition, expansion “through… specificity.” We will return to this undecidability in a later part of the present article. The text of history introduces a fundamental change into Janusz Sławiński’s concept – undoubtedly representing a point of departure for Szymutko – of the poetic function of the prose work. As we remember, that Warsaw structuralist held that the individual word which is activated semantically in a poetic work at all levels of organization, must be effaced in prose, absorbed by segments at a higher level: first by the sentence, the elementary unit in the construction of prose communication, next by great semantic figures, etc. Within the framework of the poetics of Parnicki’s novel constructed by Szymutko, the individual word is not an inactive intermediary for the synthesization of semantic figures, but due to its obligatory link with the text of history, requires exhaustive commentary, which in addition must be verified together with forward progress in reading and further readings (for it is clear that Parnicki, in Szymutko’s view, foresees multiple readings in his strategy for the reception of his works). Opening the text of history is thus linked with the necessity to create footnotes, i.e., paratexts, “irregular, divided, fragile, not to say: resembling dust; often so closely linked with a particular detail of a specific text that they have, as it were, no independent meaning (…).” Footnotes to individual words occupy enormous amounts of space in Szymutko’s work, making it practically incomprehensible to readers who attempt to read Zrozumieć Parnickiego without some knowledge of Koniec. As we can see, making the relationship between the text of the work and the text of history the central point of his analysis has the effect that Szymutko’s work itself begins to perform a function similar to that of footnotes: its addressees are exclusively those familiar with Koniec. The proliferation of footnotes was probably the reason why Szymutko’s doctoral thesis was considerably longer in its original version than in its published book form – according to Marian Kisiel, it initially “had over 600 pages of unstandardized typescript and took up two fat white folders.” With that in mind, the title of the thesis makes a lot of sense, suggesting its size and complexity: Wielość i wielkość. O “Końcu «Zgody Narodów»” Parnickiego (Multiplicity and Magnitude. On Parnicki’s Koniec “Zgody Narodow”). After the brief description above of Szymutko’s general methodological postulates, which has allowed us to notice both its originality and the impossibility of working out those postulates in their entirety, let us move on to the introduction of his 1994 article, in which Szymutko expands the relationship between the text of the work and the text of history to encompass another concept, one which still further complicates his reading of Koniec. The article “Źródło, czyli tekstu historii ciąg dalszy…” is most probably a properly refashioned portion of Szymutko’s doctoral thesis. That is indicated by the fact that in two footnotes from Zrozumieć Parnickiego, the author directs readers to that earlier text, with the added information that it is “(being prepared for publication).” The introductory part of the text published in 1994 is, however, marked by Szymutko’s move (which I mentioned in my introduction) from theory of the novel inspired by philosophy to philosophy practiced via theory of the novel and philological commentary, constituting a typical feature of his texts written after the book on Koniec. There are no references yet to Martin Heidegger, Edmund Husserl, Derrida, or Georges Bataille – regular partners in Szymutko’s later essays – but a certain direction of thought, which will find its strongest expression in the introduction to Rzeczywistości jako zwątpienia…, is already noticeable. Those who declare the inescapability of textuality unconsciously assume that progress in techniques of [historical] discourse ended in the nineteenth century; in fact history, as we can see, has not yet exhausted its possibilities and new ways of speaking are being developed in order to face new problems. It is worth noting that the title of the article problematizes the ambiguous status, mentioned earlier, of the text of history. It turns out that that text does not constitute by any means the only point of reference by which it becomes possible to establish what whole is indicated by the synecdochical text of the work. 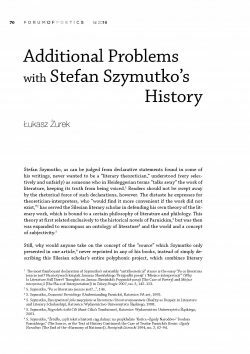 In his article, Szymutko defines the text of history as an “implied and reconstructable addition to the text of the work” or a text that is “complementary” in relation to the novel – since another source precedes it. Let us remember: in Zrozumieć Parnickiego the tension between the text of the work and the text of history, the necessity for one to be confronted with the other, merely pointed toward the horizon of the utterance, which consists of the extratextual “past tense.” Despite the strenuousness that this vision of reading assumes, the theoretically unbounded text of history was connected with what was written in the novel. To express it in the lexicon of Warsaw structuralism: the interpretation of implied information was always linked with thematized information and did not reach beyond it, regardless of how much the conclusions reached by Szymutko contradicted the letter of the text. In fact, Szymutko, too, closed himself within the “vicious circle of textualism,” as he made a shift from text (pointing with its form toward the text of history) to text (explaining the obscure parts of the text of the work). The information obtained in the course of studying sources confirms or expands the text of history, reconstructed over the course of arduous multiple readings of Parnicki’s novel. (…) The source helps in the laborious and never completely successful effort to reach historical being, in the creation of the text of history and only in its framework does it become an element in the work’s aesthetic reception. We may thus venture the hypothesis that according to Szymutko, the scheme through which Parnicki created his novels (in the reverse direction likewise the scheme of their model reading) had the following design: “historical and historiographic sources => text of history => text of the work.” The reader must quite literally assume the role of the historian, first confronting the text of the work with the unspoken but implied set of events conditioning its shape, in order to then define the relation of a whole thus reconstructed to its sources. The concept of the source stabilizes the undecidability, mentioned earlier, of the status of the text of history (which is now only “an addendum to the text of the work”), but a careful reading of the article generates a different kind of doubt: where should this additional interpretation of Parnicki’s novel end? In the case of Koniec “Zgody Narodów” the main source-addition that expands the boundaries of Parnicki’s work and “extends novelistic play beyond the novel” is William Tarn’s 600-page monograph The Greeks in Bactria and India. This means that the task of multiple readings of a (difficult) historical novel also includes reading a scholarly work of nearly equal length. It would be a mistake to treat that work on the Greco-Byzantine Kingdom as an addition to Koniec “Zgody Narodów” written by someone other than Parnicki, a very large introduction (in Genette’s terminology, that would be a special kind of allographic preface). As Szymutko shows, the relations connecting the two texts are very subtle and differentiated, and a general understanding of Tarn’s monograph is unfortunately not adequate – the direct dependencies between Koniec and The Greeks in Bactria are visible at the level of individual sentences, phrases, or words, which once more complicate (but do not render impossible) a synthesization of larger semantic figures. Listening to the voice of the source, one can (…) create a substitute epilogue for the work. Parnicki signals that the fall of the nation of the Eutydemides is the subject for a possible other novel (…) the new work would have to undertake an equally or more complicated problem. The novel whose semiotic framework has been expanded by historical and historiographical sources can, in the light of this conception, pull into its orbit other Parnicki novels related to it via characters or the period depicted as well. Where Koniec is concerned, the relevant one is the Koła na piasku (Circles in the Sand) from 1966: a considerably shorter novel, but no less formally complicated. The minuteness of the connections between the two texts, going as far as individual quotations and shifts of meaning between concepts, means that for a reader who wishes to understand this novel, it is not enough to recall the plot of Koniec, inevitably allowing the memory of particular elements in the work to be lost. “Extending novelistic play” through successive additions in the form of other Parnicki novels demands meticulous simultaneous reading, taking into account the need to reconstruct texts of history, confronting each of them with their specifically designated historical and historiographical texts, which in turn amounts to a continuous deferral of closing our interpretation. The theory of Stefan Szymutko presented above gave rise to several doctoral theses in Silesian Polish Studies circles devoted to particular novels by Parnicki. Their authors were, it stands to reason, Szymutko’s pupils: Ryszard Koziołek wrote about Twarz księżyca (The Face of the Moon), Ireneusz Gielata on Rozdwojony w sobie (Divided Within), Filip Mazurkiewicz on the first volume of Nowa baśń (The New Fairytale), and Paweł Tomczok on Muza dalekich podróży (The Muse of Distant Travel). In all of those works, the relationship of the text of the work, the text of history, and the source, while constituting the point of departure, is treated with a proper lack of deference toward its creator – those doctoral theses being primarily original enterprises. The number of footnotes Szymutko cites is overwhelming, but the work appeared to be nearing completion (I refer to the “draft” of the last letter from Markia). In a footnote to the paper Szymutko delivered at that conference, he further claimed: “The text I am presenting is part of a larger, emerging whole: it will be an explication of Part Two of Słowo i ciało.” The commentary presented by Szymutko is apparently unreadable for anyone who does not know the novel, like Zrozumieć Parnickiego, but the interpretation therein does aim in a definite direction: the scholar wishes to show that the author of the letters to Chozroes in Part Two of Słowo i ciało is not Markia, but Akwilia. Over a decade later, work on the footnotes was still continuing, and their end seemed only to keep receding further. Finally, in 2008 at the conference on “Secrets of Słowo i ciało” Szymutko admitted the failure of his scholarly project, defined outright in the title of his presentation: “Na czym utknąłem? Pokaz bezradnej lektury ‘Słowa i ciała’” (Where Did I get Stuck? Demonstration of Perplexed Reading of Word and Body). The footnotes to Słowo i ciało presented by Szymutko in 2008 are significantly different from those he showed in 1997: they are intricately layered, complex hyperlink-commentaries on individual words, referring the reader to their separate elements and to previous or forthcoming passages in the novel. Instead of the “pure pleasure of studying solutions” (i.e., what Szymutko called “aesthetic reading”), the rhizomatic footnotes effectively render reading even a short sentence of the novel more difficult. The article itself – a series of footnotes to two paragraphs from the novel – performatively bears witness to Szymutko’s failure, brought on by the imperative to expand the semiotic framework of the novel and the continuous development of the text of history: it is just as unreadable as Słowo i ciało; it explains nothing. Perhaps the failure of an ambitious undertaking in literary scholarship was seen by Szymutko as a victory of extralingual existence over the “vicious circle of textualism” and a proof of the exceptional nature of Parnicki’s writing, his stubborn insistence on “writing about reality, when it is no longer possible.” It certainly testifies to the uncommon originality of the work of Szymutko himself, for whom concepts of poetics were interwoven with the most important problems of philosophy and historiography of the twentieth and twenty-first centuries. The main purpose of the article is to reconstruct the concept of the “source” that Stefan Szymutko presented in his article “Źródło, czyli tekstu historii ciąg dalszy: na przykładzie ‘Końca «Zgody Narodów»’ Teodora Parnickiego” and to make a thorough study of what consequences its use implied for Szymutko’s scholarly practice. Doing that requires a short presentation of the concepts of “the text of the work” and “the text of history,” fundamental to Szymutko’s theory of the novel, together with their contexts and implications in philosophy and literary theory. Finally, the author shows that the interpretative complications introduced by the concept of the “source” have effectively made it impossible for Szymutko to finalize one of his most significant scholarly projects – a critical edition of Parnicki’s Słowo i ciało (Word and Body). The most flamboyant declaration of Szymutko’s ostensibly “antitheoretical” stance is the essay “Po co literatura jeszcze jest? Na motywach książek Janusza Sławińskiego ‘Przypadki poezji’ i ‘Miejsce interpretacji’” (Why Is Literature Still There? Thoughts on Janusz Sławiński’s Przypadek poezji [The Case of Poetry] and Miejsce interpretacji [The Place of Interpretation]) in Teksty Drugie 2007, no. 3, 142–153. S. Szymutko, “Po co literatura jeszcze jest?…”, 146. S. Szymutko, Zrozumieć Parnickiego (Understanding Parnicki), Katowice: FA-art, 1992. S. Szymutko, Rzeczywistość jako zwątpienie w literaturze i literaturoznawstwie (Reality as Despair in Literature and Literary Scholarship), Katowice: Wydawnictwo Uniwersytetu Śląskiego, 1998. S. Szymutko, Nagrobek ciotki Cili (Aunt Cilia’s Tombstone), Katowice: Wydawnictwo Uniwersytetu Śląskiego, 2001. S. Szymutko, “Źródło, czyli tekstu historii ciąg dalszy: na przykładzie ‘Końca «Zgody Narodów»’ Teodora Parnickiego,” (The Source, or the Text of History Continued: the Case of Teodor Parnicki’s Koniec «Zgody Narodów» [The End of the «Harmony of Nations»]), Pamiętnik Literacki 1994, no. 2, 62–94. Looking at concepts developed by Szymutko in terms of their performativity is a topic for another article. At this point I can only signal my awareness of the problem. S. Szymutko, “Na czym utknąłem? Pokaz bezradnej lektury ‘Słowa i ciała’” (Where Did I Get Stuck? Demonstration of Perplexed Reading of Word and Body) in Tajemnice “Słowa i ciała” (Secrets of Word and Body), ed. Tomasz Markiewka and Krzysztof Uniłowski, Katowice: Wydawnictwo Uniwersytetu Śląskiego, 2008, 11. S. Szymutko, Zrozumieć Parnickiego, 8. I have written about the connections between the methodology proposed by Szymutko and those of Warsaw structuralism, negative hermeneutics, and Silesian semiotics in the article “Ku innemu poststrukturalizmowi. Literaturoznawstwo według Stefana Szymutki” (Towards a Different Post-Structuralism. Literary Studies According to Stefan Szymutko), in Literatura – kultura – lektura. Dzisiejsze spojrzenie na teorie i praktyki badań literackich i kulturowych (Literature, Culture, Reading. Current Views on the Theory and Practice of Literary and Cultural Studies), ed. M. Błaszkowska, M. Kuster, I. Pisarek, Kraków: Wydział Polonistyki Uniwersytetu Jagiellońskiego, 2015, 109–133. Understood in Maria Renata Mayenowa (and Boris Uspienski)’s terms as a metatextual, information-bearing “element of the structure of the text whose function is setting a given text apart from others, showing it as a definite whole.” M.R. Mayenowa, “Tekst literacki – pojęcie całości i pojęcie ramy” (The Literary Text—The Concept of Wholeness and the Concept of Framing), in Poetyka teoretyczna. Zagadnienia języka (Theoretical Poetics. A Problem of Language), Wrocław: Ossolineum, 1974, 271. We will return to the complications introduced by Szymutko’s “source addition” into semiotic and structural understanding in a later section of this article. Judging by how frequently Foucault’s works are cited in Zrozumieć Parnickiego, he represented probably the greatest philosophical inspiration for the scholar during the phase of working on his doctoral thesis and up until the mid-1990s. From the mid-1990s on, i.e., during the period of the height of Bogdan Baran and Janusz Mizera’s activity as translators of Heidegger, Foucault yields to the author of Being and Time. See Janusz Mizera, “Uwagi o recepcji i przekładzie tekstów Martina Heideggera w Polsce” (Notes on the Reception and Translation of Martin Heidegger’s Writings in Poland,” Argument 2013, no. 2. M. Foucault, Archaeology of Knowledge, trans. A. M. Sheridan Smith, New York: Pantheon Books, 1972, 76. It is worth noting that the book ends with a fictional dialogue between Foucault (the “archaeologist” attempting to think about historu differently than the representatives of the “Annales” school) and someone who clings tightly to French structuralism (199-214). This basically corresponds to the approach of Zrozumieć Parnickiego: establishing Szymutko’s position in relation to Warsaw structuralism and Polish post-structuralists (Krzysztof Uniłowski, Krzysztof Kłosiński, Ryszard Nycz). S. Szymutko, Zrozumieć Parnickiego, 128. S. Szymutko, Zrozumieć Parnickiego, 51. G. Genette, Palimpsests. Literature in the Second Degree, trans. Channa Newman and Claude Doubinsky, Lincoln: University of Nebraska Press, 1997, 261. It can never be underscored enough that after Parnicki, Sławiński is the author to whom Szymutko has devoted the greatest number of his writings– four works in all (Ciało profesora Sławińskiego [Professor Sławiński’s Body], Teksty Drugie 1994, no. 4; Bycie humanistą. O artykułach Janusza Sławińskiego w “Tekstach” (1972–1981)(Being a Humanist. On Janusz Sławiński’s Articles in Teksty, 1972-1981), Pamiętnik Literacki 1990, no. 1; a review of Teksty i teksty (Texts and Texts), Ruch Literacki 1991, 4; and Po co literatura jeszcze jest?). J. Sławiński, “Semantyka wypowiedzi narracyjnej” (Semantics of the Narrative Utterance), in Dzieło – Język – Tradycja (Work, Language, Tradition), Warszawa: Państwowe Wydawnictwo Naukowe, 1974. I am borrowing the concept of “multiple readings” from Kazimierz Bartoszyński. See Bartoszyński, “Problem lektury wielokrotnej”(The Problem of Multiple Readings), in Powieść w świecie literackości. Szkice (The Novel in the World of Literariness. Essays), Warszawa: Instytut Badań Literackich PAN, 1991. Szymutko’s copy of Koniec “Zgody Narodów” provides material testimony to the length of time he invested in studying the novel. The book is falling apart, the notes in the margins (because of their accumulation) are practically illegible, and the pages, from being turned so many times, have begun to be transparent. Szymutko, Zrozumieć Parnickiego, 7. Foucault writes about the “micro-physics of power” in the first chapter of Discipline and Punish. See Michel Foucault, Discipline and Punish. The Birth of the Prison, trans. Alan Sheridan, New York: Vintage Books, 1995, 26. The conception of “micro-physics” itself, as the name for a certain branch of physics, also indicates the link Szymutko observes between the post-Einstein natural sciences and twentieth-century literature and philosophy. See Szymutko, “Historia – powieść historyczna – krytyka. Lata 1945–1960” (History, Historical Novel, Criticism in the Period 1945-1960), in Rzeczywistość jako zwątpienie w literaturze i literaturoznawstwie. All comments in parentheses are mine – Ł.Ż. G. Genette, Paratexts. Thresholds of Interpretation, trans. Jane E. Lewin, Cambridge: Cambridge University Press, 1997, 319. Importantly, in Genette’s concept of what makes a given text a footnote, a functional criterion is decisive – a one-word commentary on a particular quotation embedded in the main text is also a footnote. Szymutko, Zrozumieć Parnickiego, 99, 170. A kind of philosophy, let us add, that is conscious of its non-professionalism. “I know that I am using phenomenology as a tool not designed for performing this activity: I am using a scalpel to open a jar. I apologize for the terminological inexactitude, the general lack of precision, the hurried clumsiness of my theoretical argument and my ignoring of subtleties and phenomenological divisions (…) I use phenomenology and need it because it points toward a meaning which is not based in language (…) I am misappropriating [it], because I am more interested in the set of events, chance, accidental meaning (…).” Szymutko, Nagrobek ciotki Cili, 52. Szymutko, “Źródło, czyli tekstu historii ciąg dalszy,” 62. Szymutko makes direct use of this Foucault concept three years later. See Szymutko, “Parnicki: między historią a literaturą. Od ‘Aecjusza ostatniego Rzymianina’ do ‘Słowa i ciała’” (Parnicki: Between History and Literature. From Aecjusz ostatniego Rzymianina to Słowo i ciało), Pamiętnik Literacki 1997, 1, 79. Szymutko, “Parnicki. między historią a literaturą,” 63. Szymutko once again chooses Michel Foucault as the spokesman for his concept, once more referring to the quotation from Archaeology of Knowledge mentioned earlier (64–65). Szymutko, “Parnicki: między historią a literaturą,” 64. Szymutko, “Parnicki: między historią a literaturą,” 63. “At the beginning of the ‘90s, after the political turning point of 1989, the theme of the past, of memory, of history became frozen in the theater, but also in public debate. (…) But the final version of history was, naturally, te death of history – the Polish reception of Francis Fukuyama’s famous book (…) had that subtext as well.” M. Kwaśniewska, G. Niziołek, “Introduction,” in Zła pamięć. Przeciw-historia w polskim teatrze i dramacie (Bad Memory. Contra-History in Polish Theater and Drama), Wrocław: Instytut im. Jerzego Grotowskiego, 2012, 10. An obvious point of reference here is Maria Janion’s essay “Zmierzch paradygmatu” (Twilight of the Paradigm) in her book Czy będziesz wiedział, co przeżyłeś? (Will You Know What You Lived Through? ), Warszawa: Sic!, 1996. Szymutko, “Parnicki: Między historią a literature,” 64. F. Jameson, Postmodernism, or, the Cultural Logic of Late Capitalism, Durham: Duke University Press, 1991. J. Derrida, Spectres de Marx: l’état de la dette, le travail du deuil et la nouvelle Internationale, Paris : Galilée, 1993. The political implications of Szymutko’s theory of the novel and its related ontology and epistemology do become more resonant in his texts about Silesia. Szymutko, “Źródło, czyli tekstu historii ciąg dalszy,” 94. Szymutko, “Źródło, czyli tekstu historii ciąg dalszy,” 65. The “textual boundaries of Parnicki’s historical novel are practically nonexistent– sources, together with the work, create textual constellations around what really happened (…)”. Szymutko, “Źródło,” 67. This represents an expansion and radicalization of the theses of Tadeusz Bujnicki, whose article on the role of the source in the historical novel Szymutko cites in presenting his own concept. See T. Bujnicki, “Źródło w narracji powieści historycznej” (The Source in the Narrative of the Historical Novel), in Sienkiewicz i historia. Studia (Sienkiewicz and History. Studies), Warszawa: PIW, 1981. H. Markiewicz, “Odmiany intertekstualności” (Forms of Intertextuality), in Literaturoznawstwo i jego sąsiedztwa (Literary Studies and Their Neighbors), Warszawa: Państwowe wydaniectwo naukowe 1989, 213. “Often a sentence from a novel corresponds to a sentence in a historiographical work” (Szymutko, “Źródło, czyli,” 76); “After reading a historiographical work it turns out that there are no ‘non-signifying’ names in a novel, that each of them has some pedigree – some curious past or future” (Szymutko, “Źródło, czyli,” 79). According to other Parnicki scholars, his work is governed by the principle of “ramified cohesion”: the aggregate of references necessary to interpret successive works is found “within the entire authorial oeuvre of Parnicki”– let us add in the context of the concept of the “source”– all of Parnicki’s historical knowledge. See S. Cieślikowski and T. Cieślikowska, “Teodora Parnickiego pomysł powieści nieskończonej. O niektórych listach i o prozie z lat sześćdziesiątych” (Teodor Parnicki’s Idea of the Infinite Novel. On Certain Letters and on the Prose of the ‘60s), in Świat Parnickiego. Materiały z konferencji (Parnicki’s World. Materials from the Conference), ed. J. Łukasiewicz, Wrocław: Towarzystwo Przyjaciół Polonistyki Wrocławskiej, 1999, 21. Szymutko himself was conscious of the enormous investment of effort that such an approach to reading Parnicki demanded– toward the end of the article, he mentions the necessity to integrate the work of the literary scholar with that of the historian (Szymutko, “Źródło, czyli,” 92). See also such declarations by the scholar as the following: “What we need above all are proficient analyses of individual works [by Parnicki], showing what is going on (…).” “Perspektywy parnickologii. Dyskusja” (Perspectives on Parnicki Studies. Discussion), in Świat Parnickiego, 110. R. Koziołek, Zdobyć historię. Problem przedstawienia w “Twarzy księżyca” Teodora Parnickiego (To Conquer History. The Problem of Representation in The Face of the Moon by Teodor Parnicki), Katowice: Gnome, 1999. I. Gielata, Nad studnią Ateny. O “Rozdwojonym w sobie” Teodora Parnickiego (Over the Athenian Well. On Teodor Parnicki’s Divided Within), Bielsko-Biała: ATH, 2006. F. Mazurkiewicz, Podróż na Atlantydę. O I tomie “Nowej baśni” Teodora Parnickiego (Journey to Atlantis. On Volume I of Teodor Parnicki’s New Fairytale), Katowice: Wydawn. Uniw. Śląskiego, 2012. During the period 1995–2008 Szymutko published a total of four articles in which he gave an account of his work on the commentary to the novel: Czytanie Parnickiego (na przykładzie “Słowa i ciała”)(Reading Parnicki [a Case Study on Word and Body]), FA‑art 1995, no. 2; “Poza pociechą logosu (w stronę interpretacji “Słowa i ciała” Teodora Parnickiego)” (Beyond the Consolation of Logos [Toward an Interpretation of Teodor Parnicki’s Word and Body]), in Świat Parnickiego. Materiały z konferencji, ed. J. Łukasiewicz, Wrocław: Towarzystwo Przyjaciół Polonistyki Wrocławskiej, 1999, 49–57; “Ten nudzący się Chozroes, ta nudna Markia… Nuda w “Słowie i ciele” Teodora Parnickiego’” (That Bored Chozroes, That Boring Markia… Boredom in Teodor Parnicki’s Word and Body), in Nuda w kulturze (Boredom in Culture), ed. P. Czapliński, P. Śliwiński, Poznań: Rebis, 1999, 199–215 (the three texts listed above were reprinted in: Przeciw marzeniu. Jedenaście przykładów, ośmioro pisarzy [Against Dreaming. Eleven Examples, Eight Authors], Katowice: Wydawn. Uniw. Śląskiego, 2008); “Na czym utknąłem? Pokaz bezradnej lektury ‘Słowa i ciała’ Teodora Parnickiego,” in Tajemnice “Słowa i ciała”, 11–24 (the first and last of these texts were reprinted in: Po co literatura jeszcze jest?, ed. G. Olszański, M. Jochemczyk, Katowice: Wydawnictwo Uniwersytetu Śląskiego, 2013). Szymutko’s contribution to “Perspektywy parnickologii,” in Świat Parnickiego, 117. Szymutko, “Poza pociechą logosu,” in Świat Parnickiego, 49. In Szymutko’s last book published in his lifetime, Przeciw marzeniu. Jedenaście przykładów, ośmioro pisarzy, this article was reprinted with a significant change. The methodological remark in the footnote moved into the main text in the following form: “The text I am presenting is part of a larger whole which somehow is unable to emerge (…).” Szymutko, “Poza pociechą logosu,” in Przeciw marzeniu, 84. Szymutko, “Na czym utknąłem?”, 11. The English-language abstract accompanying the footnote-article, on the other hand, contains the following reflection, departing so far from the letter of the text that its author would appear to be someone other than Szymutko: “The footnotes were supposed to refer mainly to the intricate plot of the novel, but soon it turned out that almost every word requires a detailed commentary (…). The number of footnotes scared the commentator himself – what was planned as facilitation, became a sheer evidence of the difficulty of reading the text, an arduous reconstruction of chains of events and their possible senses, meaning, or, quite often just a disclosure of the interpreter’s perplexity.” Szymutko, “Na czym utknąłem?”, 23.